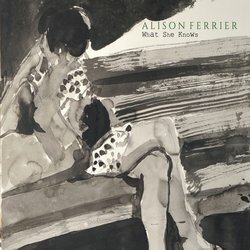 Alison Ferrier is a prolific songwriter and talented guitarist, performing regularly in Melbourne with some of the town’s best musicians. In the last couple of years, she’s played at Port Fairy Folk Festival and Cool Summer Festival, had a successful solo tour along the east coast of Australia, and made Bluebirds, an album with supergroup collaboration Suzannah Espie, Kerri Simpson and Barb Waters. She will also play at Woodford Folk Festival 17/18. Her debut album, Sugar Baby, was released in 2012, and received top reviews. She followed that up with another long player Be Here Now in 2015. She originally hails from Twickenham, on the outskirts of London. In her early twenties, she moved to Australia and met Jeff Lang, who is now her husband. Together, they travelled around Australia, the UK and America, with Ferrier working as a sound engineer. When they moved to Melbourne, Ferrier founded the Wayward Fancies and also played fiddle with Sean McMahon in the Western Union.